Located in the glorious, majestic Rocky Mountains, the city of a Grand Junction is perfect for tourists who want a vacation, and locals who want a stay-cation. From wine tasting to bike tours, from shopping in antique stores to hiking in the hills, Grand Junction has a plethora of activities to offer everyone. The largest city on the Western Slope, Grand Junction has in years past been known for its municipality. Yes, it even has an airport. In recent years, however, it has become a city known less as a Western hub - and less as a city to drive through on road trips. It has instead become better known for its ability to stand tall on its own. Rather than a thoroughfare, it is now a destination. With scenic views, new wineries, and endless things to do, it's safe to say that Grand Junction has indeed earned its "Grand" title. Any Coloradoan will tell you that they are a people who enjoy playing outside. The appeal of the couch doesn't even compare to the appeal of a pair of hiking boots or a set of snowshoes. While hiking, rafting, rock climbing, and skiing all remain popular, many locals and tourists alike have recently found an affinity for biking, both road and mountain. Grand Junction bike tours provide people with the opportunity to couple some of their greatest loves, such as physical exercise and the great outdoors. There are fewer places in the country as beautiful to bike through as Grand Junction. Certain bike tours in Grand Junction also provide participants with an opportunity they might not find anywhere else, such as a bike tour through beautiful vineyards. For some people, wine and biking is true utopia. Bike tours are a great way to exercise, without actually feeling like you are. They prove that you don't need the monotony of the gym to break a sweat. Grand Junction bike tours provide you with the opportunity to bike through canyons, vineyards, and mountain passes. They include scenery you aren't likely to find anywhere else. You can glimpse water falls, gardens, and wildlife. Bike tours are a great way to meet people who share similar interests and make new friends. Bike tours are a great activity that the entire family can take part in and enjoy. Even if your child is too young to ride a bike on their own, they can always ride along on yours. Certain bike tours Grand Junction style give you a chance to sample Colorado wine country without worrying about who's driving home. Bike tours give you the opportunity to rent bikes and helmets, so there is no need to haul your biking equipment across state or city lines. They are also ideal for people who only occasionally go biking, and thus would rather rent a bike than purchase one of their own. Certain bike tours are all inclusive, including things like lunch, snacks, and water. You only need to bring yourself. Bike tours Grand Junction style come in all shapes and sizes, from easy, family oriented trails to trails reserved for those who really want to test their limits of endurance, not to mention their lung capacity. You can bike purely for fun and relaxation or to get one of the best workouts of your life. Bike tours offer you variety. You can sign up for a specific guided tour, or simply rent a bike, hit a trail, and make up one all your own. There is certainly no shortage of things to do in Grand Junction, Colorado. A bike tour Grand Junction style is simply one idea. If the idea of biking doesn't appeal to you, if it brings up bad memories of banana seats and wicker baskets, a different Grand Junction activity might be more your style. It might be time for you to ditch the trails, and hit the water. It's no surprise that Grand Junction is known for its mountains; let's face it, they are kind of hard to miss. But, this city is also known for its rivers, more specifically one river: the Colorado River. The Colorado River may not, forgive the pun, hold water to say the Mississippi River, but it's still the best in the west. A river that extends from northern Mexico into the Grand Canyon, it can reach up to 28000 square meters per second in severe floods. In laymen terms, that translate to FAST. Grand Junction rests right next to the Colorado River, making raft tours Grand Junction style particularly appealing to the whitewater adventurer. While the Colorado River comes in from the north, the city of Grand Junction also receives the Gunnison River form the south. This leaves the rapids more raging and raft tours in Grand Junction more exciting. You can experience a great body of water. The Colorado River is indeed a grand site to behold. In fact, it was originally named the Grand River. 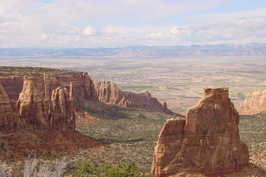 Hence the origin of Grand Junction's name. Raft tours in Grand Junction give you the opportunity to raft some of the best rapids in the West. The summer months bring both warm rivers and raging rivers, the rapids are sure to appease even the biggest thrill seeker around. Grand Junction raft tours have something for everyone. From the experienced rafter looking for huge wondrous rapids, to the rafting novice who wants to take it slow and easy. River tours Grand Junction style offer you different option, from a raft packed full of family and friends to an inflatable kayak that‘s simpler to maneuver. Grand Junction is home to one of the most beloved whitewater challenges: the Westwater Canyon. This route beings on the outskirts of the city and travels through 12 of the most exciting whitewater spots in the Western US. This challenge subtly tells the Great Mississippi to "shut it." Raft tours Grand Junction style give you the opportunity to experience something that you can't do every day, or even every week. For anyone who doesn't live directly on a river, whitewater rafting is only an occasional enjoyment. True whitewater rafting is often seasonal. During certain times of the year the waters may be too high or too low, to fast or too low. Thus, you have to get when the getting - and the rafting - is good. Whitewater rafting is something that the entire family can enjoy. If you are rafting with children, you will likely opt for an excursion that is a little less raging. But, no matter the speed, your family is sure to find an exciting time. Whitewater tours are safe. While there is always some danger when dealing with Mother Nature, raft tours Grand Junction style are guided by experienced and agile hosts. They maintain your safety as their number one goal. Whitewater tours are a great way to keep your kids entertained for an entire day. Many tours last all day long, with lunch and snack breaks taken in between riding the rapids. Your family will have fun all day, and your kids will be tired at night. Like a biking tour, a raft tour Grand Junction style is a great way to get exercise without actually feeling like you are. Rowing on the rapids isn't easy, but you'll have so much fun you won't even notice you're breaking a sweat. The Western Slope gets hot, sometimes reaching triple digits in the summer time. While this isn't ideal for some outdoor activities, such as hiking or rock climbing, it is ideal for whitewater rafting. Raft tours Grand Junction style is a great way to cool off on a scorching summer day. Grand Junction is a great place to visit, whether you are looking to raft, ski, bike, or hike. But, it's certainly not the only place on the Western Slope worthy of your visit. If you're looking for something a tad different, try looking in the direction of Paonia. Paonia is certainly not as large as Grand Junction, and not as well known. In fact, many people may have never even heard it of. Small, hidden, and beautiful, Paonia is one of Colorado's best kept secrets. But, it's a secret that is quickly being told. Despite its mysteriousness, Paonia has been around for quite a while, first settled in the late 1800's. It has still managed to stay small, with a population smaller than some large city high schools. In 2001, less than 1900 people occupied the city. While Paonia may not compare to Grand Junction in size or in people, it does provide for similar activities. Like it's sister city, Paonia is also a great place for raft tours, hiking, shopping, and bike tours. Like it's sister city, Paonia is known for majestic views and unrivaled scenery. Bike Tours Paonia Style give you a different view of the Western Slope. Like Grand Junction, Paonia offers mountain passes and magnificent vineyards. But, unlike Grand Junction, Paonia offers a small town feel that you can't find in the larger metro areas. Bike tours are safe. When you take proper precautions and wear the proper safety gear, bike tours Paonia style are one of the safest ways to enjoy the great outdoors. Bike tours allow you to see the sights, and get some exercise at the same time. You might be too blown away by the scenery to realize all the calories you are burning. Bike tours Paonia style give you the opportunity to cover a lot of ground. Because of the relatively small size of Paonia, a bike tour may just allow you to see the entire city in under a day. There are many exciting things to do in this gem of a town. Start with bike tours Paonia style and go from there.